Your son or daughter is mobile now – walking, talking, and ready to climb onto a bike! To help you enjoy this magical time even more, we’ve set out to find the very best balance bikes for sale. Scroll down for the top 10 balance bike reviews for kids from toddler age to 4-5 years old. 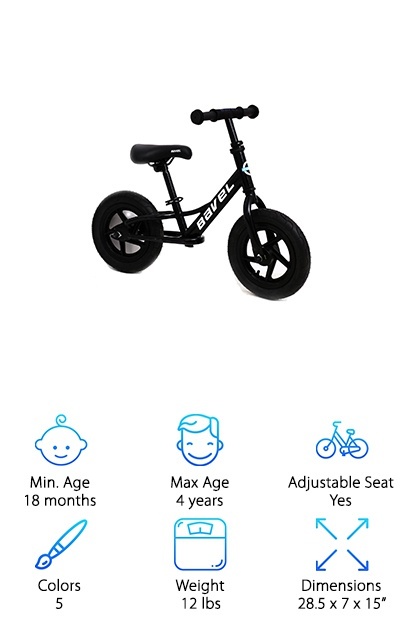 You’ll be able to pick out the perfect balance bike at an affordable price point, with the safety features and accessories that matter to you. Sound good? Let’s go: Here are the specs we’ve tracked down, so you don’t have to. Min. Age - We’ll help you find the best balance bikes for those little arms and legs. Check here to see if your baby or toddler is ready to graduate to a brand-new balance bike for toddlers and learn how to hit the road! Max Age - Balance bikes are a wonderful option for your active 3, 4 and 5-year-old kids. We’ll let you know if the product maxes out at a certain age, so you can pick something out that lasts a long time. 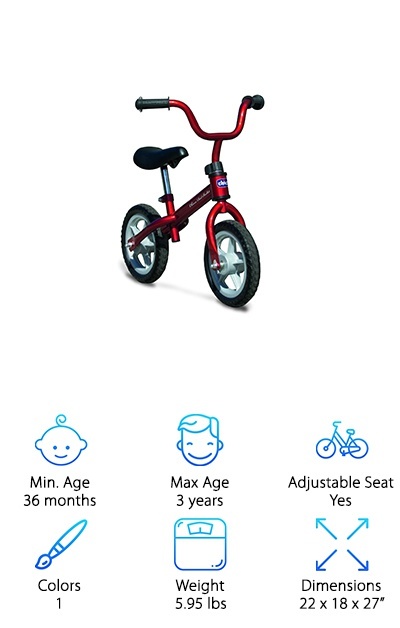 Adjustable Seat - A balance bike normally comes with a number of adjustable features, and this is one of the most important for parents. Can the best balance bike transform to seat your toddler, and will it still rise to fit your 4-year-old? We’ll let you know! Colors - How many color options are available on the balance bike of your dreams? Whether your dream balance bike comes in just one or two colors, or ten, our comprehensive reviews will include every option available. Weight - Some parents look for a lightweight frame in a balance bike; others want to know that the frame is stable enough to support a larger kid. We’ve got a spectrum of options and reviews ready for you to make your choice! 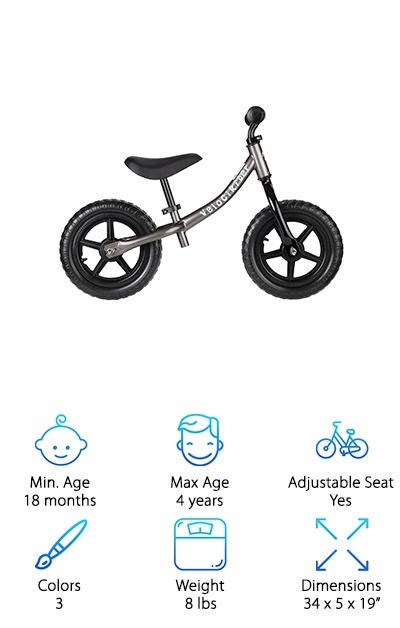 Dimensions - In addition to providing the weight of the best balance bikes, we will also give you their dimensions in height, length, and width. Don’t worry! We’ll help give you a great idea of what the bike looks and feels like before it’s ever delivered. Now that you know how we’re breaking things down, it’s time to climb on and go for a ride. Pick out the most stylish, the most durable, or the most practical balance bike according to our expert reviewers. Then put a bow on the best kid’s gift ever! If you’re in a hurry, just do this one thing: check out our excellent top product pick and budget pick, and you’ll find something affordable and appealing for you and your family. In our opinion, this is the best kid’s balance bike of the bunch. It’s easy to see why: available in 10 dynamic color options, the Strider Sport Balance Bike has a sporty look and a wonderfully adjustable frame. It will seat kiddos from one and a half years old to five years old, an excellent range. Your son or daughter can grow with their balance bike! Adjust both the seat and the handlebars as the years go by. Add a heavier foot brake or bigger tires as your child grows more capable of handling her ride. And it gets better: at just 6.7 pounds, it’s easy to transport and take with you to the park or a day on the beach boardwalk. 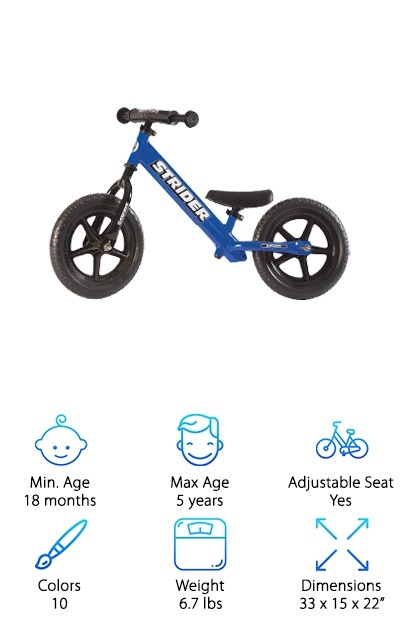 The Strider Balance Bike provides a way for your child to independently learn to ride a balance bike before taking the next step and losing those training wheels. Try it out today, and your child is sure to love it! The Critical Cycles Cub Balance Bike takes our pick as one of the most affordable of the gang! This is a great starter balance bike for the toddler eager to gain a little independence and hop onto two wheels. Why? The balance bike’s innovative design: like Fred Flintstone, your child will power this bike with their feet instead of using pedals. You can sit back and smile as your son or daughter rides a “real bike” and controls their pace and speed with their own two legs. This balance bike is designed for kids 20 months and older, and goes all the way up to fit a 5-year-old. And here’s the big scoop: the tires are air-free and will never go flat, so you don’t have to invest in a balance bike pump, too. 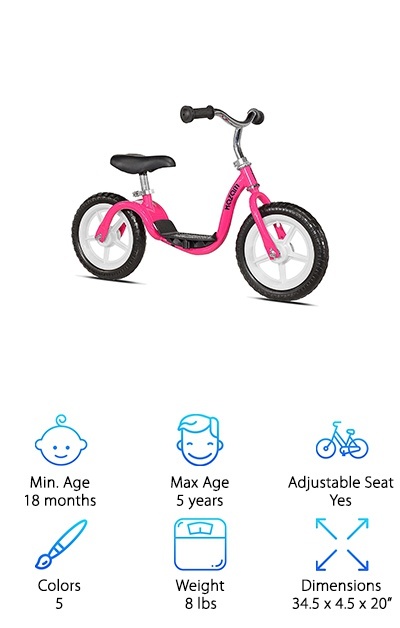 Pick from two shades of blue, pink, orange and more color options, and carry this smaller balance bike around with you easily at only 9 pounds in weight. The Banana Balance Bike appears to be a great choice for smaller boys and girls. Our research shows toddlers and younger kids could have an easier time climbing aboard this balance bike available in three dynamic color options. This bike features a new and upgraded design, including an upgraded seat, handlebars and an even easier-to-assemble design. An important note: assembly is required here, so if you’re buying this balance bike as the ultimate present, parents need to hide the box until they can put the bike together! This balance bike does not use pedals: kids will learn to balance using their own feet, a more reassuring option for many parents concerned about potential crashes. At just a little over 7 pounds, a 2 or 3-year-old can easily maneuver and move the bike both indoors and outdoors. Our reviewers say this bike may prove a little small for the bigger 4 or 5-year-old. The Schwinn Balance Bike is a sturdy option for tykes excited to hit the pavement. It’s one of our heavier balance bike options at almost 14 pounds and comes partially assembled. It should take someone an average of 15-30 minutes to put this sporty balance bike together. 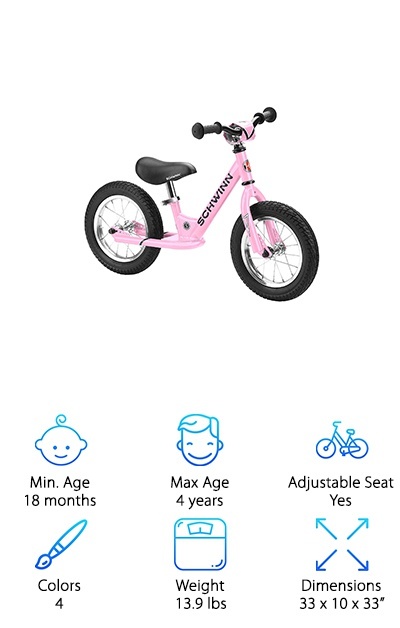 Here’s the cool part: the Schwinn Balance Bike boasts a unique foot-to-floor design for toddlers and kids who need a little more stability wheeling around. It also has both an adjustable seat and adjustable handlebars, moveable easily thanks to quick-release clamps. The tires are made of rubber, while some bikes will come with plastic tires, which can be dinged or damaged a little more easily. The balance bike is priced within the middle range of our favorite balance bikes, and boasts a solid build thanks to its steel frame and puncture-proof tires. Cater to your child’s favorite color options with four choices: blue, green, pink or red. The Chicco Red Bullet Training Bike is a stylish, ergonomic balance bike for the kid eager to learn to ride. It’s really designed for kids ages three and up, although our reviewers do note that bigger and more physically capable 2-year-olds should also be just fine. So, if you have a toddler yearning for their first bike, check out our other options. This balance bike only comes in one color: classic red. It’s also on the lighter side at just under 6 pounds. 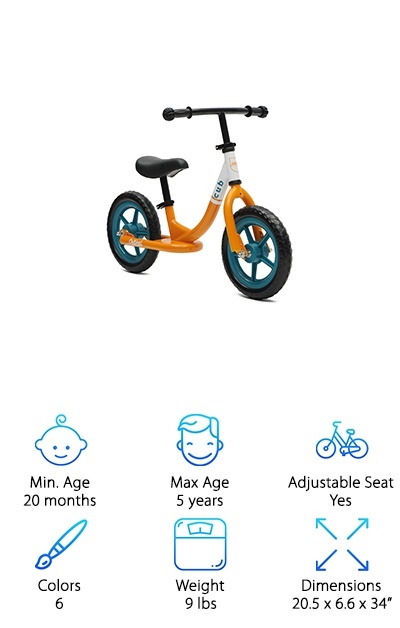 The price is also more than affordable, especially in comparison to all of the other best options in the balance bike realm. If price matters to you, take a close look at the Chicco Red Bullet Training Bike. Just picture it: Your eager child will grab their helmet, put on their pads, climb on board and coast… to better balance, confidence, and another lap around the park. This balance bike’s sleek design and dense foam tires will prove to be a durable choice. One word for this balance bike that sums it up well is “sturdy.” Designed for kids 2-6 years old, the Enkeeo Sport Balance Bike features an anti-rust steel frame that can support a child weighing up to 110 pounds. As your little person grows, the seat and handlebars can be adjusted accordingly. And this balance bike comes in some more unusual color options, including the very sleek silver style. Be warned: this bike is a little more expensive than some of the other options our expert reviewers selected. But watch out for great sales with this one! It’s known to be selected for deep discounts. Besides, it comes with some great features, including how lightweight it is at less than 6 pounds. 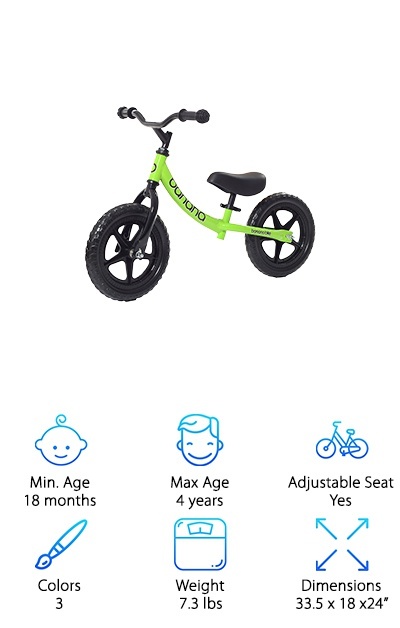 The puncture-resistant tires and eco-friendly, non-toxic materials are also reasons why this is one of the best balance bikes for your buck. So what are you waiting for? Check it out now! Want to know what sets the KaZAM v2e balance bike apart? There’s a design feature you’ll want to know about. It’s so innovative, it got the creators of this bike an audience on Shark Tank. It’s the footrest built into the bike’s center of gravity, helping the eager rider to find their balance. Girls and boys trying out a balance bike for the first time will be delighted to discover this intuitive addition. They’ll also love the price, and the five vivid color options. Imagine yourself walking alongside your son or daughter, coasting for the first time on this no-pedal bike as the family gets out for some fresh air. You’ll be relieved to hear this – you’ll never have to pump the tires on this bike. They’re puncture-resistant and maintenance-free. The best kid’s balance bike is somewhere in this bunch, and the KaZAM is a fine place to start! There’s only limited assembly required, and they include the tools, so no need to stress. The name of the Teddy Shake Toddler Balance Bike makes it clear: this bike is great for the littlest riders. And it’s true! 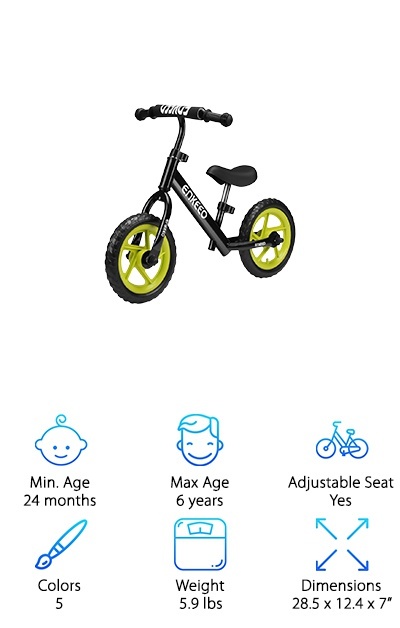 With a minimum riding age of 18 months, this is one of the best toddler balance bikes around. It’s got a lot of bells and whistles, too. Parents will be happy to hear that the makers of this balance bike boast easy assembly with just five pieces to put together. This no-pedal bike comes with an Allen Wrench, and you’ll be amazed to hear that that’s all you need. We were excited, too! We were also big fans of the quick-clamp technology that makes for easy seat height adjustment. The no-puncture, no-fill tires are a pretty great bonus on this balance bike, too. You’ll also be happy to know this bike comes with a 3-year warranty. Select from blue, gray, or pink for your color scheme. What are you waiting for? Let’s get riding! Sometimes simple is best, and that’s true in the case of the CyclingDeal Kids Push Bike. This kids balance bike is one of the most affordable options checked out by our expert reviewers. Aside from the great price point, there are also dynamic colors available for purchase (black, white and blue). The seat is adjustable, the tires have great traction, and they’re durable and lightweight. In fact, the whole bike weighs in at around 7 pounds. That’s perfect for the three-year-old running to the shed to grab the bike for playtime. What’s more perfect than a lightweight, simply-designed balance bike for some quality time with family in the sunshine? Portable is best when it comes to the ideal children’s toy. And yes, it gets better: there’s a lifetime warranty available on the frame! So pick out the best color, get the wrapping paper out, and purchase a balance bike that grows right along with your child. 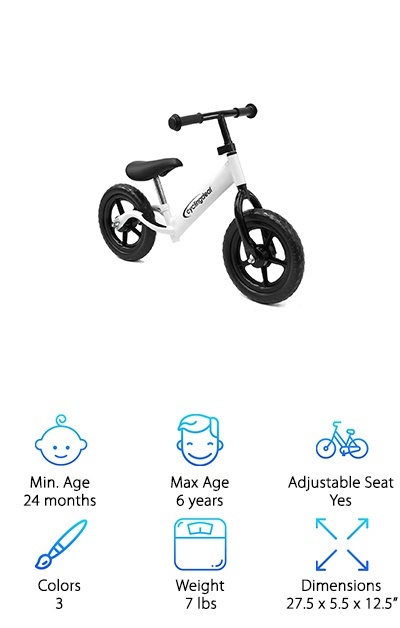 If you’re looking for the higher-quality best balance bike for 4 year olds, we’ve got the one for you. The Bavel Kids Balance Bike sports a classic design and 5 eye-popping color options: black, blue, pink, red and yellow. It can be purchased at a great price. This is another balance bike designed simply to do one thing: teach kids to balance using their feet. That way, the transition to a pedal bike is much quicker and more intuitive. Assembly is simple, with tools included. How great is that? That’s not all: both the seat and the handlebars are adjustable. Kids aged 18 months and up can enjoy this balance bike both indoors and outdoors. At 12 pounds, this bike is a little heavier than our other selections, but still easily managed. You’ll be pleased with the quality of materials and design with this kids balance bike. It’s perfect for gifting! Try it out today, and put the biggest smile ever on a kid’s face.